He wasn't offered an agent position. He was offered a data analyst position which i assume likely akin to his course. It's a shame he has negative sentiments about the BPO industry and cannot see past the fact that it's not all about being an agent but there are other departments and other opportunities in a call center career. 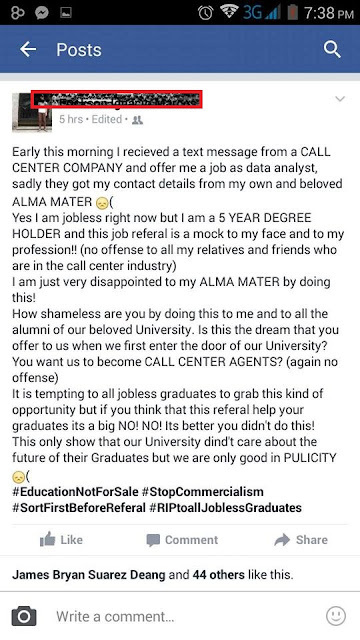 It's also sad that in his 5 years of college he never learned that Call Centers has helped in improving our economy and that the post offered might kick start his line of expertise. What a shame. Architecture graduate sya, so I understand where he's coming from. 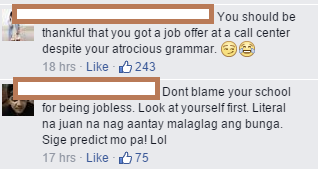 Sayang ang skills nya for the post being offered. There are BPOs that handle architecture and engineering firms, and yes, they handle things from the basics to the upper level work, here in the Philippines. Not all BPOs are call-related. Business Process Outsourcing means jobs that get sent to be done offshore from the main office, usually in another country where the company could be cost-effective vs hiring employees locally in their area which might mean more expense. This kid needs to wake up. He's no longer in school and needs to learn how the real world works before he hurts himself. Hiyang hiya naman ang accenture sayo. Tutal taga NU Ka naman daw simulan mo na mag design ng mga SM. Archi...pwede sana sa Graphics department...kaso sa attitude nya...wag nalang. Makapagmataas naman si kuya..taas ng pinag-aralan..higaan/upuan sa bahay lang naman kayang bagsakan. Hates the crowd in them. Hates the idea of working with them. Hates the fact a policeman earns a basic pay of 29K plus allowances he earns 50K a month, something a call center agents supervisor earns and not get shot at. Thinks call centers are like sardines factories where people stink and gossip while on aux. Like this right now. The alternative was you joining ISIS but became one instead.. in a call center. Where do you think you will be 5 years from now? If you answered pay for obligations like bills, feed the family, buy medicine for the loved ones... common.. we all know even at 35K its never enough. Maybe 60K is decent. Give the competitiveness argument to India they are cheap unless.. you are. Indian or cheap or both. The angry alumni matter did not deserve the dignity of a comment. Don't ask me why I bothered but your welcome. Drink your vendo machine dispensed coffee, rise and shine.. its 10 mins past the hour of midnight since you went on aux... aboard the Death Star.